Launching today, Art on the Underground in partnership with the best of Britain's moving image organisations kick off an initiative that will last for one year across four seasons of film programming to be displayed on a brand new big screen in the heart of London's commuter district, Canary Wharf. Film and Video Umbrella take the inaugeral mantle, showcasing works from their 30 year back catalog by artists Dryden Goodwin, Mark Lewis, Melanie Manchot and Suki Chan and debut a new work by the duo behind artist-run image making platform no.w.here, Karen Mirza and Brad Butler. Dazed Digital: What's the piece that you're showing on the big screen? Karen Mirza and Brad Butler: Hold Your Ground is a companion film to a larger film work commissioned by Film and Video Umbrella that we have scripted in conjunction with the science fiction author China Miéville. The larger film, 'Deep State' (which will come out in the Spring), is inspired by the events of the Arab Spring, and the discovery we made whilst in Cairo last year of a pamphlet containing instructions for pro-democracy demonstrators called 'How to Protest Intelligently'. DD: It's entitled 'Hold Your Ground' what does this refer to? Karen Mirza and Brad Butler: Within 'How to Protest Intelligently' there is a page which depicts a protestor defending themselves from violence by the police. Adjacent to this is the text, 'Hold your Ground, Egyptian!'. The figure in 'Hold Your Ground' struggles to turn utterances into speech, the repetition of the phonics that work to comprise full words and sentences are presented here to convey the difficulty of speech - speaking out - and holding one's ground. 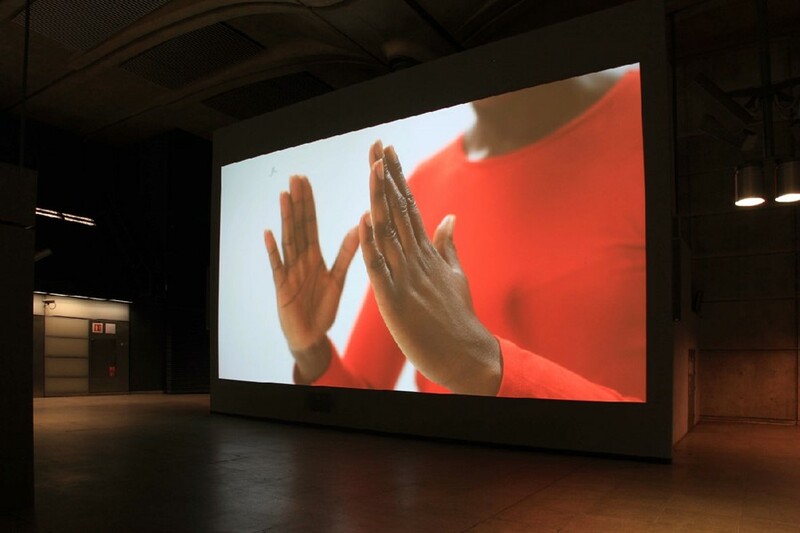 The combination of gestures and speech in the action of the figure is an attempt to teach a new language to the viewer; the repetition should function as a form of 'training' that is informed by the archive footage of public assemblies and demonstrations which slice through shots of the woman against the white background. DD: How did you come up with the idea? Karen Mirza and Brad Butler: Hold Your Ground is produced specifically with the site of Canary Wharf station in mind, which has informed both the content and the visual/aural qualities of the film. We want to use this opportunity to present a film in public offers us an opportunity to comment upon the site of Canary Wharf. DD: Where's the footage from? Karen Mirza and Brad Butler: The footage is from Egypt, Northern Ireland, the March 26th demonstration of last year and Occupy London. DD: What do you think changes or needs to be considered by it being outside? Karen Mirza and Brad Butler: The challenges and constraints present themselves as formal, visual challenges, in terms of a responsibility towards the audience who are not necessarily 'choosing' to see the work in the same way as one 'chooses' to visit a gallery or screening, and by proxy may have a more fleeting encounter with the film. DD: What do you think the public will make of it? Karen Mirza and Brad Butler: It's impossible to say as there isn't one 'public'. We have consciously edited the film in order to present it as a work that can be entered hopefully at any point during the loop, taking into consideration that viewers will primarily be in transit, encountering the screen from a distance with the sound out of reach, becoming audible as people move down the escalators and towards the screen. We hope the shifts from a stark figure powerfully gesturing against a white background to scenes of crowded public spaces over-spilling with bodies will resonate with the commuter experience of relentless pressure placed on bodies squeezed into a train carriage, and the atomisation of individual passengers. DD: How are you hoping to contribute to the daily lived experience of those who pass the piece? Karen Mirza and Brad Butler: Ideally, the sentiment of the film - Hold Your Ground - should provoke some sense of instability in the viewer, and perhaps a moment to reflect upon the manner with which we pass through our daily lives, including those hours spent on public transport. DD: Do you think people will register it as art and therefore as different from the advertisements commonly seen on underground screens? Karen Mirza and Brad Butler: We can't imagine there will be one response or the other - some people may not register the film at all; it may just become part of their daily intake of visual imagery, others may be more interested. This is why we are interested in working in public space - in expanding the potential discussion around this work beyond the gallery. DD: Why is this screen an important addition to the proliferation of screens we see everyday? Karen Mirza and Brad Butler: Hopefully, what is displayed on this screen presents a visual counterpoint to the privatisation of public space.